“Nation-to-nation”: What do Parties think it means? Over the course of this (long) election campaign, the Liberal Party of Canada and the New Democratic Party of Canada have both invoked the language of international co-operation with Indigenous peoples in their platforms. The Conservative Party, have not. “We will immediately re-engage in a renewed, respectful and inclusive nation-to-nation process,” the Liberal website reads. “We feel it is time for a new era and a new federal government that embraces a true Nation-to-Nation relationship,” the NDP announced. This rhetoric demonstrates that these two parties have paid attention to the conversations that have been ever more present in the era of Idle No More. And while rhetorical flourishes are to be expected on the campaign trail, the potential implementation of such policies lead me to believe that these are either hollow promises, or that the Parties simply don’t know what they’re saying. Certain actions lead me to lean toward the latter. During the Munk Debate on Foreign Policy on 28 September 2015, Justin Trudeau eulogized his late father, Prime Minister Pierre Elliot Trudeau, in response to Tom Mulcair’s critique of P.E. Trudeau’s decision to invoke the War Measures Act, likening a past Liberal policy to the party’s recent support of Bill C-5, the Conservative Government’s anti-terrorism legislation. “Let me say very clearly, I’m incredibly proud to be Pierre Elliott Trudeau’s son. And I’m incredibly lucky to be raised with those Liberal values,” Trudeau said. Trudeau and Jean Chrétien (who has been trotted out by the Liberals during this campaign), were the architects of the 1969 White Paper, or Statement of the Government of Canada on Indian Policy. 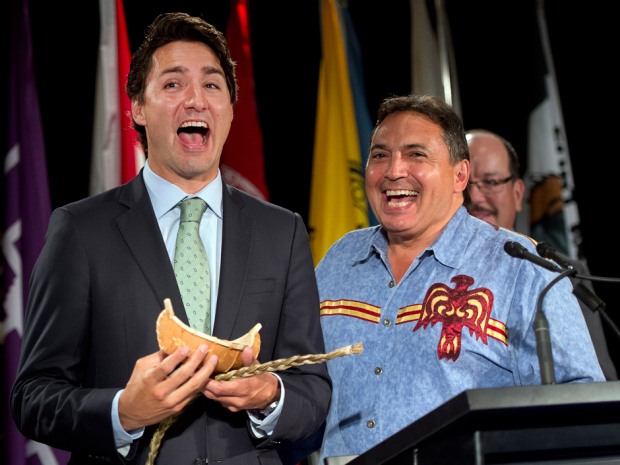 The White Paper was famously designed to terminate Indigenous title and rights as Indigenous peoples. It proposed that Indigenous National territories be reduced to real estate, bought and sold on the market. This stands in stark contrast to a relationship between nations. The White Paper was, as Arthur Manuel describes it, the “opening shot” in the modern battle for Indigenous rights in Canada, and it of course sparked immense backlash. The Paper failed, but it has lived on in Canadian Indian Policy (Liberal and Conservative): title extinguishment, treaty termination, and ending the existence of sovereign peoples. (See Manuel’s 2015 book Unsettling Canada) In this tradition, the CPC recently promised to introduce on-reserve private property ownership, should they be re-elected. How can the Liberal Party reconcile its internationalist promises while parading around figures such as Chrétien and Trudeau? Along with the NDP, the LPC have committed to implement the United Nations Declaration on the Rights of Indigenous Peoples. “We will […] enact the recommendations of the Truth and Reconciliation Commission, starting with the implementation of the United Nations Declaration on the Rights of Indigenous Peoples,” read the LPC website. “NDP have committed to […] ensure that all government decisions respect […] the principles of the United Nations Declaration on the Rights of Indigenous peoples,” reads a statement from the NDP. I’ve focused on the LPC, not because I believe that the NDP is offering a wholly divergent path, but because of the particularly cavernous inconsistencies within Liberal rhetoric. There appear to be two explanations for the in the internationalist rhetoric of the NDP and LPC with respect to Indigenous peoples. Firstly, if the rhetoric is meant to court the “Indigenous Vote”, achieving this outcome will depend upon Indigenous voters who either do not recall the Trudeau and Chrétien governments and have no knowledge of Canadian and International law, or prioritize other issues (education, poverty aleviation) over sovereignty. And we know that many who do prioritize sovereignty, chose to abstain from voting in Canadian elections altogether. In the second case, the use of nation-to-nation rhetoric would be superfluous. Second, the alternative explanation, is that the rhetoric is not mean to court the “Indigenous Vote”. I suspect that this language is meant to appeal to Canadians, who have to varying magnitudes learned over the past few years about the broken relationship through events, public figures, and pop culture: Idle No More, MMIW, John Ralston Saul’s The Comeback book tour, The Orenda winning Canada Reads, Wab Kinew appearing frequently on CBC radio, Tanya Tagaq and Buffy Sainte Marie winning Polaris prizes, A Tribe Called Red’s successes, the findings of The Truth and Reconciliation Commission, Ashley Callingbull’s activism, etc. If Canadian voters are seeking solutions to a vague and enduring “Indian problem”, the Liberal rhetoric offers RealChange™ without fundamentally unsettling the relationship. For further sources on the three leading parties’ stated promises with respect to Canada-Indigenous relations, see below. Sources for photos one and two. The chief of the Whispering Pines-Clinton Indian Band is quoted in the platform document saying the proposed legislation is “First Nations-led.” Chief Michael LeBourdais says his First Nation created the proposed property ownership legislation, according to the document. “We will immediately re-engage in a renewed, respectful and inclusive nation-to-nation process with Indigenous Peoples to advance progress on the issues prioritized by First Nations, Métis and Inuit communities – issues like housing, infrastructure, health and mental health care, community safety and policing, child welfare, and education. “As a matter of national priority, we will develop a Federal Reconciliation Framework, created in full partnership with Indigenous Peoples. Reconciliation starts with recognizing and respecting Aboriginal title and rights, including treaty rights. A Liberal government will do just that. Not only in accordance with Constitutional obligations, but also with those enshrined in the UN Declaration on the Rights of Indigenous Peoples -something the current government has steadfastly refused to do. To this end, we will conduct a full review of the legislation unilaterally imposed on Indigenous Peoples by the Harper government, through the lens of section 35 of the Constitution. Where measures are found to be in conflict with Aboriginal rights, where they are inconsistent with the principles of good governance, or where they simply make no public policy sense, we will rescind them. “Yes. Tom Mulcair and Canada’s New Democrats recognize the right of the Métis people to self- government and have a deep commitment to developing Canada’s Nation-to-Nation relationship with the Métis Nation. This will remain a constant priority for an NDP Government. We feel it is time for a new era and a new federal government that embraces a true Nation-to-Nation relationship, built on respect and committed to making meaningful progress for Métis citizens. 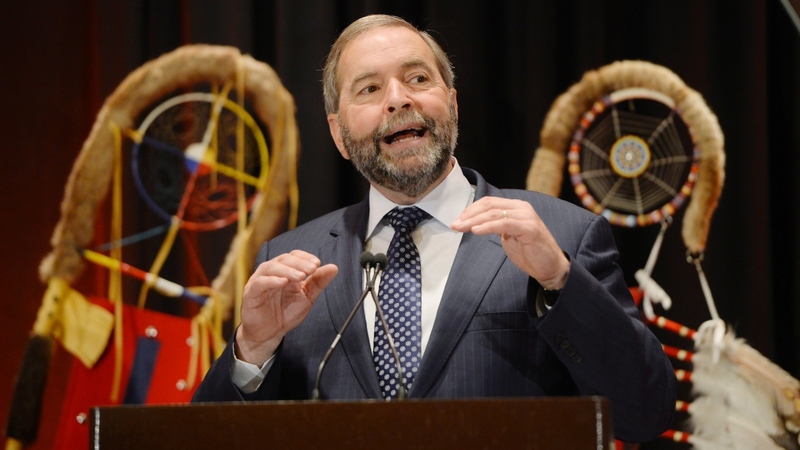 The NDP has a long history of fighting for the rights of Indigenous peoples, including Métis peoples, most notably illustrated by the insistence of the NDP and Ed Broadbent that Aboriginal Treaty Rights be enshrined in the Canadian Constitution.